US President Donald Trump's campaign did not conspire with Russia during the 2016 election, a summary of Special Counsel Robert Mueller's report says. The allegation clouded the first two years of Mr Trump's presidency and his allies see the report's finding as a boost to his re-election chances. But Attorney General William Barr's summary is inconclusive as to whether Mr Trump obstructed justice. Despite the inconclusiveness of the report regarding allegations he obstructed justice, the president said it constituted "complete and total exoneration". The report was the culmination of two years of investigation by Mr Mueller which saw some of the president's closest former aides prosecuted and, in some cases, imprisoned, although not on charges related to the alleged Russian collusion. "The special counsel did not find that any US person or Trump campaign official conspired or knowingly co-ordinated with Russia," Mr Barr writes. On the issue of whether justice was obstructed, Mr Mueller's report says: "While this report does not conclude that the president committed a crime, it also does not exonerate him." In his summary, Mr Barr said the report "ultimately determined not to make a traditional prosecutorial judgment". There was, he adds, insufficient evidence "to establish that the president committed an obstruction-of-justice offence". How have Trump's allies responded? "Great job by Mr. Mueller and his team to thoroughly examine all things Russia," he added. "Now it is time to move on, govern the country, and get ready to combat Russia and other foreign actors ahead of 2020." Mr Trump's lawyer, Rudy Giuliani, said the report had been better than he had expected while Republican Senator Mitt Romney welcomed the "good news", tweeting that it was now "time for the country to move forward". Democratic House Speaker Nancy Pelosi and Senate Democratic Leader Chuck Schumer said in a joint statement that Mr Barr's letter "raises as many questions as it answers" and called for access to the full report. "For the president to say he is completely exonerated directly contradicts the words of Mr Mueller and is not to be taken with any degree of credibility," the statement said. "Barr says that the president may have acted to obstruct justice, but that for an obstruction conviction, 'the government would need to prove beyond a reasonable doubt that a person, acting with corrupt intent, engaged in obstructive conduct'." Democratic Senator Richard Blumenthal, a member of the Senate's Judiciary Committee, said that while there was a lack of evidence to support "a prosecutable criminal conspiracy", questions remained over whether Mr Trump had been compromised. Responding to news that Mr Trump had been cleared of collusion, Alexei Pushkov, a member of Russia's upper house, tweeted: "Democrats, Russophobes and leading media created a virtual conspiracy which existed only in their heads and in headlines, and nowhere else." The release of the report's key findings on Sunday could mark the start of a lengthy battle to see the entire Mueller report made public. 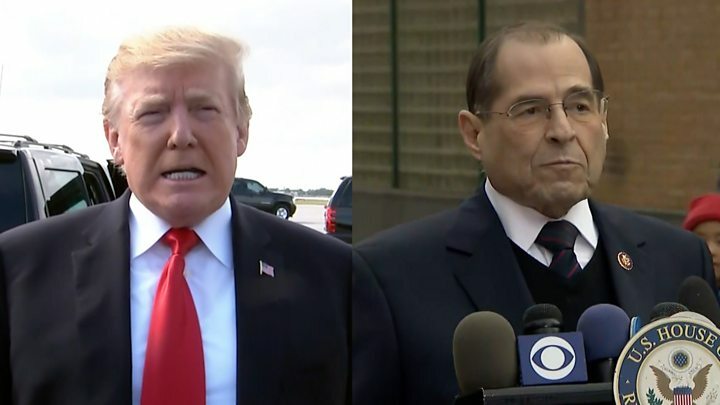 Jerry Nadler said he would ask Mr Barr to testify in front of the House Judiciary Committee "in the near future" over "very concerning discrepancies and final decision making at the Justice Department". Attorney General Barr summarises, mostly in his own words, the conclusions of the special counsel's investigation. In one key line, however, he directly quotes the report. "The investigation did not establish that members of the Trump campaign conspired or co-ordinated with the Russian government in its election interference activities." There, in Robert Mueller's own words, is the end result of nearly two years of work, 2,800 subpoenas, hundreds of search warrants and countless hours of interviews. There were "multiple offers" of help from "Russian-affiliated individuals" to the Trump campaign, but they never took the bait. There was, as Donald Trump might say, "no collusion". At least, no evidence of it was unearthed. The obstruction of justice component is a murkier matter. The decision of whether to charge Mr Trump with interference with the various investigations wasn't Mr Mueller's. Saying it involved "difficult issues", the former FBI director punted. Instead, Mr Barr - in consultation with Department of Justice staff - decided not to prosecute, in part because there was no apparent underlying crime to obstruct. While a bevy of inquiries into his presidency will grind on, the shadow of Mr Mueller's investigation - hovering over the White House since May 2017 - has been lifted.